The Canadian Shield is a physiographic division, consisting of five smaller physiographic provinces: the Laurentian Upland, Kazan Region, Davis, Hudson and James. The shield extends into the United States as the Adirondack Mountains (connected by the Frontenac Axis) and the Superior Upland. The Canadian Shield is U-shaped and is a subsection of the Laurentia craton signifying the area of greatest glacial impact (scraping down to bare rock) creating the thin soils. The Canadian Shield is more than 3.96 billion years old. The Canadian Shield once had jagged peaks, higher than any of today's mountains, but millions of years of erosion have changed these mountains to rolling hills. The Canadian Shield is a collage of Archean plates and accreted juvenile arc terranes and sedimentary basins of the Proterozoic Eon that were progressively amalgamated during the interval 2.45 to 1.24 Ga, with the most substantial growth period occurring during the Trans-Hudson orogeny, between ca. 1.90 to 1.80 Ga. The Canadian Shield was the first part of North America to be permanently elevated above sea level and has remained almost wholly untouched by successive encroachments of the sea upon the continent. It is the Earth's greatest area of exposed Archean rock. The metamorphic base rocks are mostly from the Precambrian (between 4.5 billion and 540 million years ago) and have been repeatedly uplifted and eroded. Today it consists largely of an area of low relief 300 to 610 m (980 to 2,000 ft) above sea level with a few monadnocks and low mountain ranges (including the Torngat and Laurentian Mountains) probably eroded from the plateau during the Cenozoic Era. During the Pleistocene Epoch, continental ice sheets depressed the land surface creating Hudson Bay, scooped out thousands of lake basins, and carried away much of the region's soil. When the Greenland section is included, the Shield is approximately circular, bounded on the northeast by the northeast edge of Greenland, with Hudson Bay in the middle. It covers much of Greenland, Labrador, most of Quebec north of the St. Lawrence River, much of Ontario including northern sections of the Ontario Peninsula, the Adirondack Mountains of New York, the northernmost part of Lower Michigan and all of Upper Michigan, northern Wisconsin, northeastern Minnesota, the central/northern portions of Manitoba away from Hudson Bay, northern Saskatchewan, a small portion of northeastern Alberta, and the mainland northern Canadian territories to the east of a line extended north from the Saskatchewan/Alberta border (Northwest Territories and Nunavut). In total, the exposed area of the Shield covers approximately 8,000,000 km2 (3,100,000 sq mi). The true extent of the Shield is greater still and stretches from the Western Cordillera in the west to the Appalachians in the east and as far south as Texas, but these regions are overlaid with much younger rocks and sediment. The Canadian Shield is among the oldest on earth, with regions dating from 2.5 to 4.2 billion years. The multitude of rivers and lakes in the entire region is caused by the watersheds of the area being so young and in a state of sorting themselves out with the added effect of post-glacial rebound. The Shield was originally an area of very large, very tall mountains (about 12,000 metres or 39,000 feet) with much volcanic activity, but over hundreds of millions of years, the area has been eroded to its current topographic appearance of relatively low relief. It has some of the oldest (extinct) volcanoes on the planet. It has over 150 volcanic belts (now deformed and eroded down to nearly flat plains) whose bedrock ranges from 600 to 1200 million years old. The Sturgeon Lake Caldera in Kenora District, Ontario, is one of the world's best preserved mineralized Neoarchean caldera complexes, which is 2.7 billion years old. The Canadian Shield also contains the Mackenzie dike swarm, which is the largest dike swarm known on Earth. The high pressures and temperatures at those depths provided ideal conditions for mineralization. Although these mountains are now heavily eroded, many large mountains still exist in Canada's far north called the Arctic Cordillera. This is a vast deeply dissected mountain range, stretching from northernmost Ellesmere Island to the northernmost tip of Labrador. The range's highest peak is Nunavut's Barbeau Peak at 2,616 metres (8,583 ft) above sea level. Precambrian rock is the major component of the bedrock. The lowlands of the Canadian Shield have a very dense soil that is not suitable for forestation; it also contains many marshes and bogs (muskegs). The rest of the region has coarse soil that does not retain moisture well and is frozen with permafrost throughout the year. Forests are not as dense in the north. The Shield is covered in parts by vast boreal forests in the south that support natural ecosystems as well as a major logging industry. The boreal forest area gives way to the Eastern Canadian Shield taiga that covers northern Quebec and most of Labrador. The Midwestern Canadian Shield forests that run westwards from Northwestern Ontario have boreal forests that give way to taiga in the most northerly parts of Manitoba and Saskatchewan. Hydrographical drainage is generally poor, the soil compacting effects of glaciation being one of the many causes. Tundra typically prevails in the northern regions. Many mammals such as caribou, white-tailed deer, moose, wolves, wolverines, weasels, mink, otters, grizzly bear, polar bears and black bears are present. In the case of polar bears (Ursus maritimus) the Shield area contains many of the denning locations such as the Wapusk National Park. The Canadian Shield is one of the world's richest areas in terms of mineral ores. It is filled with substantial deposits of nickel, gold, silver, and copper. Throughout the Shield there are many mining towns extracting these minerals. The largest, and one of the best known, is Sudbury, Ontario. 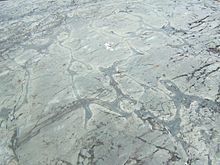 Sudbury is an exception to the normal process of forming minerals in the Shield since the Sudbury Basin is an ancient meteorite impact crater. Ejecta from the meteorite impact was found in the Rove Formation in May 2007. The nearby but less known Temagami Magnetic Anomaly has striking similarities to the Sudbury Basin. This suggests it could be a second metal-rich impact crater. The Flin Flon greenstone belt in central Manitoba and east-central Saskatchewan is one of the largest Paleoproterozoic volcanic-hosted massive sulfide (VMS) districts in the world, containing 27 copper-zinc-(gold) deposits from which more than 183 million tons[clarification needed] of sulfide have been mined. ^ "Canadian Shield Archived 2006-08-21 at the Wayback Machine" in Columbia Encyclopedia. 6th ed., 2005.